Actor Ian McDiarmid returns in Star Wars Episode 9: The Rise of Skywalker as the Sith puppet master Emperor Palpatine, one of the franchise’s biggest villains. The teaser trailer for Star Wars Episode 9: The Rise of Skywalker released on Friday at the Star Wars Celebration in Chicago ended in a chilling note with the evil cackling of Emperor Palpatine after featuring Rey and Kylo Ren in a deadly showdown. Star Wars fans immediately recognized Emperor Palpatine’s (Ian McDiarmid) signature evil cackle from Return of the Jedi (1983). The trailer also revealed the official title of Star Wars Episode 9 for the first time. After the teaser trailer ended and the hall lights came back on, the audience was surprised to see actor Ian McDiarmid, 74, on the stage in character. McDiarmid is already well-known to Star Wars fans from his portrayal of Emperor Palpatine in the last two episodes of the original trilogy (1977-1983), although he appeared only as a hologram in the second episode, The Empire Strikes Back. Palpatine was killed in the final episode of the original trilogy, Return of the Jedi, when Darth Vader threw him down a deep shaft into the Death Star’s engines to save his son Luke from Force Lightning torture. McDiarmid also appeared as Senator Palpatine in all episodes of the prequel trilogy (1999-2005). But McDiarmid and his character did not appear in the first two installments of the sequel trilogy, although we hear his voice in The Force Awakens when Rey has a vision of the character after handling Luke Skywalker’s lightsaber, which also belonged to Anakin Skywalker (Darth Vader). 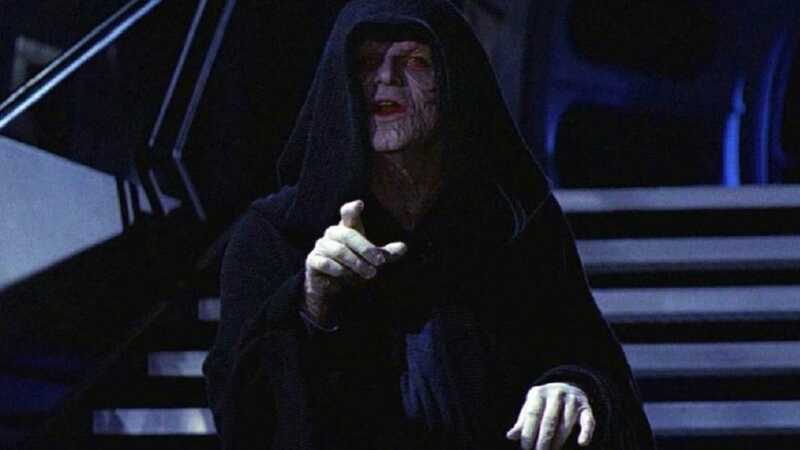 On Friday, April 12, director J.J. Abrams revealed that McDiarmid would return as Palpatine in Star Wars Episode 9: The Rise of Skywalker. However, in what form Palpatine returns in Star Wars Episode 9 remains to be seen. He might not return physically except if he somehow miraculously survived the fall down the shaft into the Death Star’s reactors in Return of the Jedi. Otherwise, we will see him return either as a vision or as some kind of Force Specter or ghost. Star Wars Episode 9: The Rise of Skywalker premieres on December 20, 2019.